I don’t even like juice, so I might’ve known this fast was going to be a fail when I signed up for Joe Cross’ three-day weekend juice cleanse. I was feeling lethargic and my tights were a little too tight, thanks to a food and wine-laden week. Joe’s promise of a reboot was appealing—a kind of deprivation born of desperation—with some health benefits thrown in. Not too many years ago the Australian-born businessman was 100 pounds overweight and on a lot of prescription pills. Jump in juice. While celebrities like Gwyneth Paltrow try to persuade me my colon needs cleansing (it does not, according to medical experts) how bad could it be to exist on fruits and vegetables for a few days? Health Canada recommends adults eat at least seven servings of them. In fact, a study published in the International Journal of Epidemiology, says more is better. Researchers from Norway, the United States, and Britain analyzed data from 95 independent studies that involved hundreds of thousands of participants to conclude that five servings a day protects against heart disease, all kinds of cancer, and early death from any cause. But participants who took down ten daily servings of fruits and vegetables also doubled down their benefits. 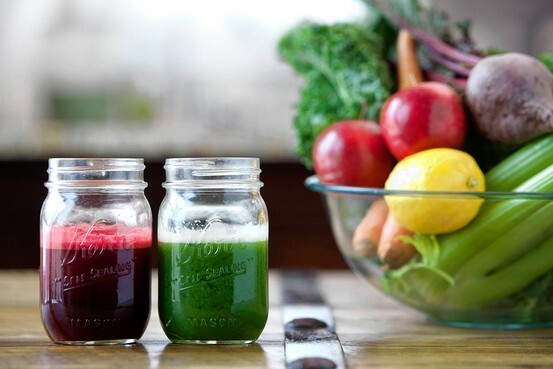 Could a juice fast be my ticket to purge the terrible toxins and hit my daily target? Because it is so much better to suffer together, I asked my 20-year-old daughter if she would join me on the juice. “If Joe Cross can do it for two months, we can do it for three days,” I insisted. While juicing retains many of the health benefits of whole fruits and vegetables, most of the fiber in fruit is concentrated in the skin, seeds and membranes, which juicing can leave behind. That makes the argument it’s better for you, kind of hard to swallow. Still, Joe urged me to drink nothing but the freshly made stuff from morning through until dinner, at which time I could eat a healthy meal. Three days straight. Beginning with Carrot-Apple Ginger juice, followed by the Mean Green mid-morning juice, Gazpacho juice for lunch, Citrus inspired green juice for an afternoon snack, and then the Sunset Blend pre-dinner juice. Finally, when you’re faint with hunger but still haven’t left your kitchen because you’ve been making juice all day, you can prepare dinner. We left the grocery store with the following: Sixteen cucumbers, three bags of celery, boxes of spinach, bags of apples, carrots, sweet potatoes, bell peppers, tomatoes, limes, lemons, clementines and some Swiss chard; onions, ginger parsley, and more. What we didn’t buy was the juicer. “What’s wrong with our blender?” I asked. “A blender is not going to properly process all this stuff,” my daughter said. Which, as it turned out, was only moderately successful. The breakfast juice was tasty until we needed a spoon to pull out all the pulpy pieces. “This is not juice,” my daughter complained, chewing. By the time we returned from walking the dog, we were famished. “Time for our midmorning juice!” I merrily exclaimed. “But it’s only eight,” Tay noted. By the bottom of the glass, I understood why it was Mean and Green. Cranky and slightly nauseated, my acid reflux was acting up. By 11 AM my belly was on fire. The thought of another glass of citrus-chunky juice striped with ginger strands was painful. “How hungry are you?” I looked mournfully at my daughter. “Eggs and toast?” she asked, pulling out the frying pan. It’s hard to juice without a juicer. If you’re game to give it a go, do yourself a favor and get a proper appliance. Also get out the Gaviscon if you have GERD (gastroesophageal reflux disease). In this case, juicing might not be for you. It’s hard to use sixteen cucumbers before they go bad. Scaling back your protein and fat intake can make you moody, weak and generally feeling like crap, so consider adding these elements into your juice. Weight loss may occur but the pounds will likely return quickly once you begin eating. Replacing a meal a day with a homemade juice might work best. Our liver and kidneys are designed to rid our body of toxins just fine, thank-you. Those who suffer immune compromised disorders, low blood pressure, acid reflex or blood sugar abnormalities will not do well with this kind of cleanse. In some cases juice can interfere with medication potency, so check with your doctor. While juicing can be a healthy way to add more servings of fruits and vegetables, it’s best viewed as a supplement to a balanced diet.